Costa Rica’s Turrialba is one of a pair of stratovolcanoes overlooking the city of Cartago. It is some 10 km WNW from the neighboring Irazu volcano. There is a broad saddle between the two active volcanoes. Turrialba is 3,340 m high. It is one of Costa Rica’s largest volcanoes, covering some 500 km2. The current series of eruptions began in Jan 2010 with a series of phreatic eruptions. Since then there have been some eight confirmed eruptions with nothing larger than a VEI 2. The ninth and current series of eruptions began in Feb. 2016 and is ongoing. The area around Turrialba is sparsely populated, with a national park surrounding the edifice. There over 670,000 people within 30 km and nearly 3.4 million within 100 km of the dual volcanoes. The volcano is surrounded by the Turrialba Volcano National Park which is currently closed due to the current activity. Prior to 2010, the volcano was a popular hiking destination. The park is around 3,900 acres of mostly rain forest. Hiking in the rain forest on the flanks of the volcano, visitors encounter lava flows from previous eruptions. There is a local myth surrounding the origin of the volcano. A young maiden fell in love with a warrior of a different tribe, something which was forbidden. They were caught by her father embracing in the forest. He called for his archers to kill them. At that point, the forest came alive, opening a cavern to hide the couple. Smoke and steam rose from the spot to mark the love and joining of the two tribes, marking the beginning of Turrialba. Turrialba is about 35 km to the east and upwind of the capital city of San Jose. The volcano is topped with three craters in the SW end of a summit depression measuring 0.8 x 2 km that is breached to the NE. Most of the current activity comes from the summit crater complex. There are a pair of pyroclastic cones on the SW flank. The volcano itself is subduction driven with primary eruptive products being andesite – basalt. When the magma sits long enough, it ages to a dacite product. The current series of eruptions have produced a very ashy product closing local airports and creating breathing difficulties for local residents. The prevailing winds blow from the Caribbean into the mainland (E to W). San Jose and other major cities of the Central Valley are generally downwind, with some 2.1 million getting regularly dusted in the current series of eruptions. Turrialba is a huge volcano, with a volume of over 400 km3, some 112 km3 of it deposited recently. The two volcanoes reside in the Limon Basin, a volcanic sequence dating back as far as 4.5 Ma. The oldest rocks deposited by both volcanoes date 850 Ka. Basement volcanics of Turrilaba are shared with neighboring Irazu volcano. They date back to 850 Ka. The second stage of growth took place between 600 – 250 Ka. This is concurrent with a well defined pulse of volcanic activity in Costa Rica that began 600 ka. The most recent growth stage takes place after 250 ka. The most recent eruption stage includes at least four episodes of activity – 99 – 90, 61 – 60, 25 and 10 – 3 Ka. Three of these episodes include lavas from both the high and low silica group indicating a zoned magma chamber. The flow units are typically mafic basaltic andesites and silicic andesites to dacites. There are also pyroclastic units sampled and dated. 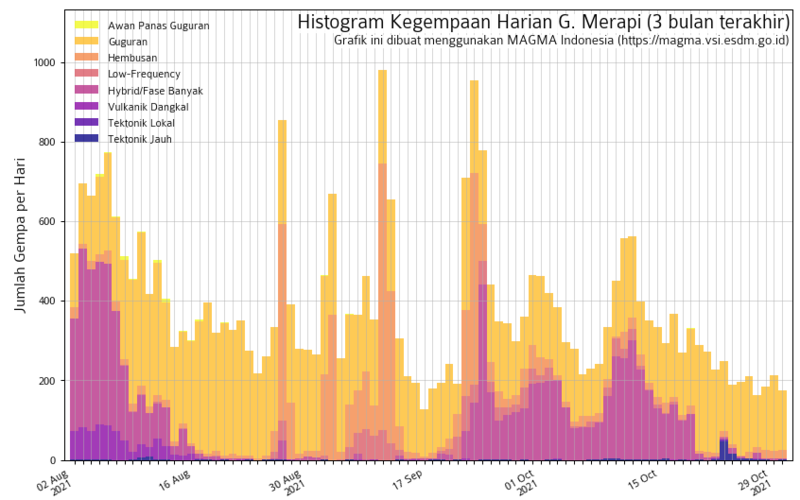 Over the last 100 Ka, there has been near simultaneous eruption of mafic and silicic magmas. This is not uncommon for stratovolcanoes and the content of silica in the erupted magmas increases over time. A thesis suggests the system is fed by a long-lived magma chamber with an evolving silica top above a mafic base that is fed from the mantle. When this happens, typically the more evolved magma is erupted first followed by the less evolved magmas. So far, comparison of the erupted magmas has not been made. 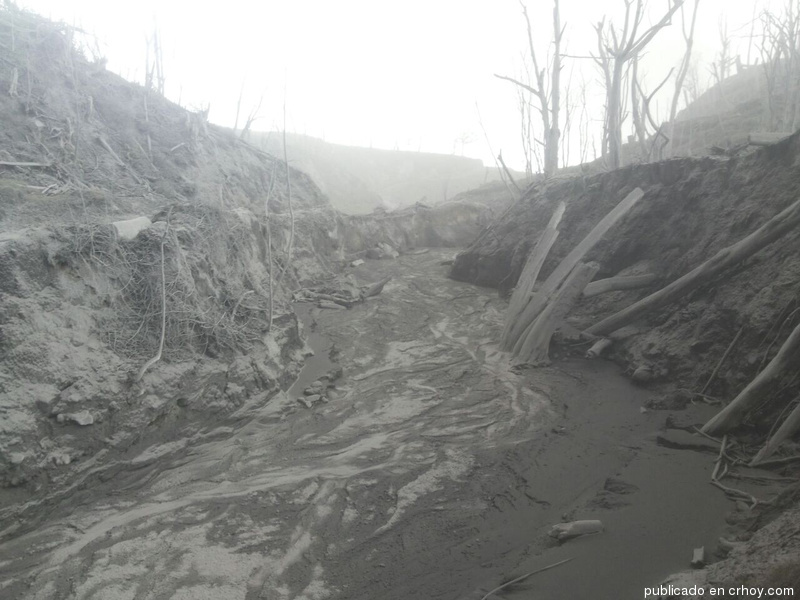 The silica-rich lavas also point to an explosive eruption style for Turrialba. Tephra layers around the crater rim measure in the 10 – 50 cm range. Those measurements do not hold up in distances away from the crater rim. There are at least 20 eruptions of basaltic to dacitic lavas and tephras recorded on Turrialba’s summit. There was significant erosion that coincides with the last glacial episode on Costa Rica’s central mountains. It is likely that Turrialba was glacier covered during this time and the glaciers removed the upper portion of the peak. The first post-glacial eruption produced massive andesite to dacite lava flows around 9,300 BP. There have been six eruptions from Turrialba over the last 3,400 years. The largest of which was a VEI 4 in 1910. That eruption produced pyroclastic flows and surges. Total volume erupted was 0.2 km3 dusting some 5,000 km2. Volumes of the other five eruptions were much smaller and not identifiable in downwind soils, though they are measured around the summit. The only known historical magmatic eruption took place from 1864 – 1866. The current activity appears to be moving toward a magmatic phase. Given the average precipitation of 174 cm / year, the volcano is well saturated leading to a significant threat of phreatomagmatic eruptions – basically steam explosions when magma flashes water contained in the saturated rock to steam. Given the soft material of the cone and the downwind ash, lahars and flank avalanches / debris landslides are active and significant threats. The first description of Turrialba was in 1723 which described an eruption of neighboring Irazu and smoke coming out of Turrialba. Since that time, fumarole activity was generally observed. The mid-19th century eruption sequence began as early as 1847 with continuous smoke and fumes. Activity seemed to ramp up in the 1850s with continuous steam columns from the crater vents. Fire coming out of the volcano was described in 1861. By 1864 the steam had changed to ash with ashfall being reported starting in August. There were explosions and trembling also reported. By January 1865, ash was falling as far as 30 km downwind. Explosions were continuous and most violent by January and February 1866. Volcanic activity in Costa Rica is driven by subduction of the Cocos Plate under the Caribbean Plate. The offshore Cocos Ridge is also subducting under the Caribbean in the vicinity of Costa Rica. The offshore trench is the Middle America Trench to the west. 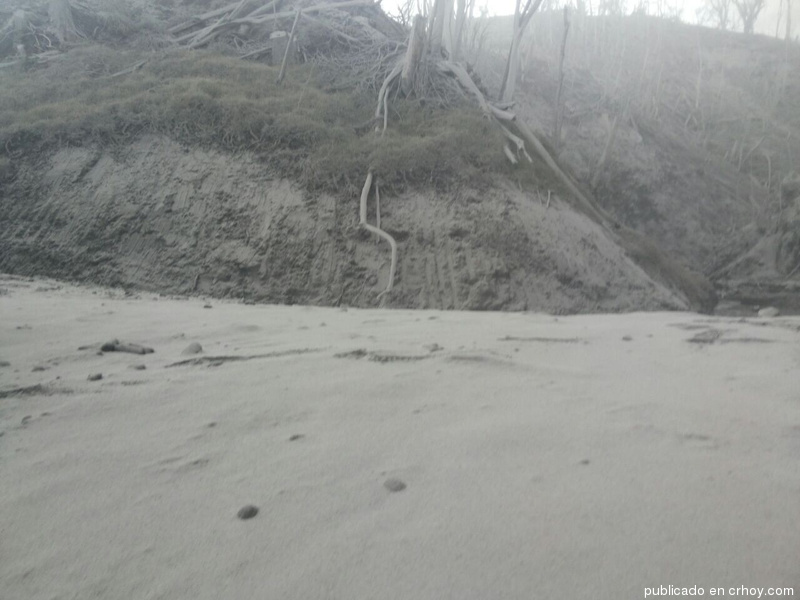 The crust under Turrialba is some 25 km thick. The subduction has driven both the volcanic activity and significant earthquakes over time. The most recent large one was a 7.6 Richter in Sept. 2012. AVO: “A short-lived explosive eruption of Bogoslof volcano was reported by several pilots around 0100 UTC (4:00 pm AST). They reported a volcanic ash cloud rising to an estimated altitude of 34,000 ft (10.3 km). Satellite data show a discrete, short-lived explosion just prior to 0100 UTC that detached and drifted to the south by 0115 UTC. A subsequent pilot report from 0150 UTC indicated that activity had decreased. maybe it is just me, but I immediately fall for islands like this.. nice placid bit of grass and a stinking great lava dome on one end, no wait both ends! 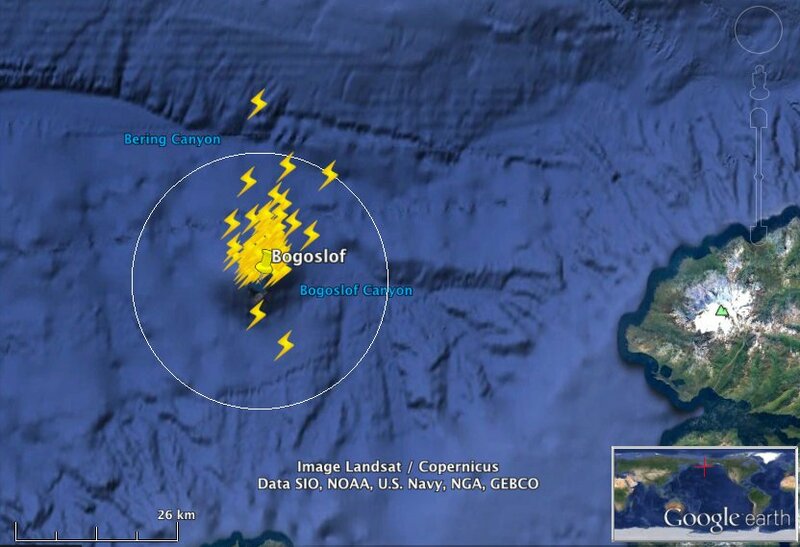 Bogoslof: Eruption lasted 25 minutes as detected by regional infra-sound network. Alert lowered to Orange/Watch. Ongoing seismicity including bursts of tremor detected on seismic networks on neighbouring volcanoes throughout today. You can clearly see the tremors on the Makushin webicorder on AVO’s website. I have a feeling this is going to result in a “proper” eruption soon probably with a new lava dome. Could be quite a nuisance for a while! Cayambe: Swarms still ongoing, periods of long-period events, strong sulphur smell at summit and it appears the hydrothermal system is being disturbed- the glaciers are beginning to crack. This could be definitely become very interesting! Hudson: Seismic unrest has stabilised for now. Doesn’t seem like much is going to happen here. Nevado del Ruiz: Seems that activity is heading for background levels; looks like the current eruptive period could be ending. Sabancaya: Internal activity still increasing, looks to be building towards quite vigorous activity. 2 Images by Orlando Luna from http://www.crhoy.com/archivo/actividad-del-turrialba-hace-prever-ceniza-para-rato/nacionales/ (article from 22 May 16). Bogoslof has just erupted again, back to RED/WARNING. Thanks for the updates, mjf! And this was the cloud; looks to me as if there were two sources? Ouch, that looks strong! I bet they got a holy shock when they saw it first, thinking Okmok was playing up! On Twitter, Alexa Van Eaton (‏@volcanologist) posted this lots-of-lightning image and said, Lightning possibly enhanced by surtseyan behavior from seawater. Erik Klemetti said, probably a vulcanian eruption. So, I’m off for a few days, happy Holidays everyone! a fascinating place. A history of dome formation, indicates the eruptions are not so gas rich and the multiple locations of domes also suggests the vent regularly gets plugged up and has to find somewhere else to erupt, which it seems to do pretty regularly: 1796-1804, 1806-1823, 1883-1895, 1906, 1907, 1909-1910, 1926-1928. Merry Xmas everyone! Hope you have a nice break Graniya! Guess what? Bogoslof again! Somehow I think AVO might just perhaps be wishing they had monitoring networks there… Most definitely a VEI-3 now.